There’s something fundamental about being out at night on a lonely mountain meadow, listening to the flowing water of a nearby stream, the wood fire having long died out, leaving the stars as the only source of light to pierce through the darkness. Something ancestral – an awe inherited from generations long past, encoded in our genes and in the tales of the first men. The stars are parts of our lives much more than we realize. Essentially, everything that is around us – and in us – was forged a long time ago inside a stellar furnace. Carbon, which is such a fundamental building block of our DNA, and all of the chemical elements that are heavier than carbon, all originate during the life cycle of stars. This is already a strange concept. Within a human life-time, the stars appear eternal and unmovable, so it’s hard to imagine that they also have a beginning and an end, that they are born and die, over a time span of many thousands of human generations. The author of the first astronomy text-book I ever read compares humans looking at the stars to ants in a forrest. Ants don’t live long enough to see an individual tree evolve; but they see the acorns on the ground, and sprouting young oak trees, and majestic full-grown trees, and broken rotting tree stumps, and from this they can infer what the long-term life of a tree looks like. Likewise, we see many “adult” stars in the night sky, but sometimes astronomers also come across large clouds of gas from which baby stars are just being formed, and very old stars about to go out with a bang. If you look closely at our own Galaxy, the Milky Way, a collection of billions of stars that appears as a bright band of light in the night sky, you may notice a darker stripe that goes through the middle of this band. These are clouds of gas and dust which block the light from stars in the Milky Way that are behind them. Within these clouds, stars are currently being born. Stars get the energy that they radiate in the form of light through nuclear fusion. Hydrogen atoms collide and are welded together into a helium atom, releasing energy. When the hydrogen is consumed, helium atoms are combined into carbon and oxygen atoms, releasing more energy. For 99% of stars, this is the beginning of the end. Once the helium is almost all consumed, the star blows a large part of its outermost shells into space, enriching its surroundings with carbon, but not really with any heavier elements. When there is no helium left, the source of energy is exhausted, and gravity takes over, condensing the star into a really tightly packed ball. How tightly packed is a matter of quantum mechanics, which sets a limit on how close together electrons like to be to each other, formally known as the Pauli exclusion principle, which says that no two electrons can occupy the same quantum state. At this point, the star has become a white dwarf – as massive as the Sun but about as small as the Earth. It is still pretty hot, so it shines much like a white-hot iron would, and will just cool off as time goes on until it becomes invisible. The biggest 1% of stars, those bigger than 8 times our Sun, have a different fate. They have such a tremendous pressure in their interiors that, once the helium is consumed as well, they can go on to transform carbon and oxygen into a cascade of elements, like neon, sodium, magnesium, aluminum, silicon, sulphur, argon, calcium, nickel and iron. Welding two iron atoms together no longer releases (but actually necessitates) energy, so the process stops here. Gravity again takes over, and the stellar core collapses – but this time, the quantum mechanical forces which stopped gravity from compressing white dwarfs too tightly are not strong enough, because there is so much more mass involved. Electrons are (sort of) pushed into the protons, creating an incredibly dense ball of neutrons known as a neutron star, which is again about (1.4 times) the mass of the Sun, but only 12 km in radius. Neutrons also don’t like to be too close to each other (in fact they like it less than electrons), so in most cases quantum mechanics now wins over the squeeze of gravity. But if the star was really, really, really massive, even the quantum mechanical disliking of neutrons from being too tightly packed isn’t enough, and nothing can stop the gravitational compression any more. The core of the star becomes a black hole. Meanwhile, this whole pushing of electrons into protons in the stellar core releases enough energy to produce a big explosion which sends many of the chemical elements that the star had produced in its outer layers hurling into space, to become future sandy beaches and DNA molecules. During this big explosion, for a few days, the dying star shines extremely bright, sometimes brighter than the galaxy that it is a part of, earning it the term “supernova”. The material expelled into space after a supernova explosion is known as a supernova remnant. There is one other way in which stars can become supernovae. This happens when one of the white dwarfs has a companion star, whose atmosphere spills over with time, bringing the white dwarf’s mass above the threshold that quantum mechanical forces can support against the squeeze of gravity. The whole white dwarf literally blows up, leaving nothing behind. This is called a “type Ia” supernova, and will be very important when we look at the history of the Universe later on. 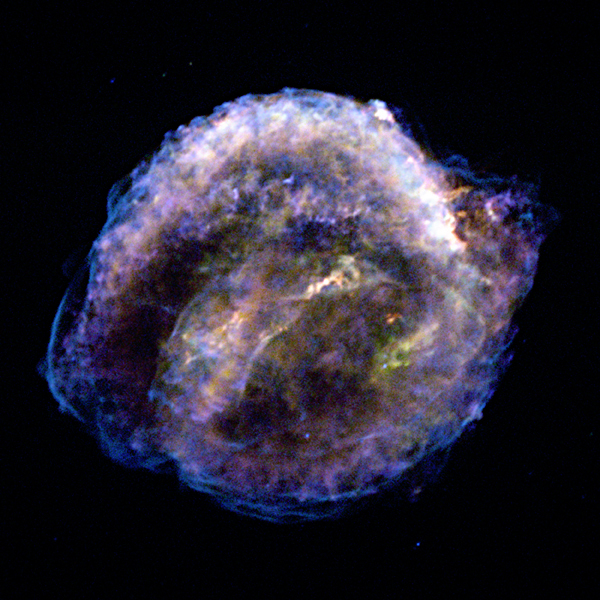 Kepler’s Supernova Remnant seen with the Chandra X-ray Observatory. Credit: NASA/CXC/NCSU/S.Reynolds et al. Many supernovae are observed in the nearby Universe every year. The last core-collapse supernova in our own Milky Way was probably visible some time in the late 1600s, and it produced the supernova remnant Cassiopeia A which can be studied today. There are unfortunately no good records of this particular supernova; the last documented supernova seen in our Galaxy was recorded by none other than Johannes Kepler himself in 1604, and was of type Ia. The first historical record of a supernova in our Galaxy dates all the way back to the “guest star” observed by Chinese astronomers in the Book of Later Han in 185 AD. The last supernova visible to the naked eye was a core-collapse in 1987 in a nearby galaxy, the Large Magellanic Cloud. But in the distant past, supernovae were much more frequent than they are now. So, chances are, the atoms your body is made of were forged about 10 billion years ago in the heart of a star that is now long dead. The universe recycles well, wouldn’t you say? Tagged carbon, iron, life cycle of stars, neutron stars, oxygen, silicon, supernova remnants, supernovae, white dwarfs.